Hi everyone. I treated my husband and myself to a day out with a new restaurant yesterday. If you know my husband you know when it comes to eating out he pretty much stays in a rut on where to go to have dinner. After walking through the German fest we decided to go out for dinner. My husband’s suggestions Arby’s, Hardies, etc., get the picture? I retorted that he was in a rut and we should try something new. He gave me that look of what have you got up your sleeve now? My answer was let’s try that dumpling restaurant over in East Village. Since I couldn’t quite remember the name or the exact address we spend about ten minutes driving around East Village looking for the restaurant. We pulled over to try and google it on his phone. Low and behold I find out he deleted his WIFI connection on his phone so there we sat as I tried to remember where it was located and he sat behind the wheel wanting desperately to go to a fast food joint. I finally remember it should be around 3rd or 4th Street in between Walnut and Court. As we buzzed by 3rd I saw Molly’s Cupcakes and a sign on the building across the street from it. I had him drive around the block so we could investigate. 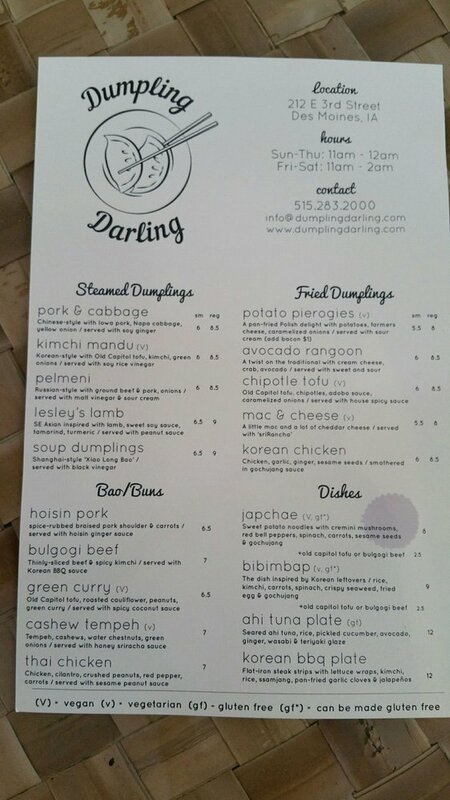 He of course tried to turn the other way on 3rd but we finally arrived at our destination, Dumpling Darling, 212 East 3rd Street, Des Moines, Iowa. We got there around two pm. which turns out to be a good time because the dinner crowd is gone and there was only one other couple having dinner. Yes I am from the old school of the mid-day meal is called dinner not lunch and the evening meal is supper. I ordered the Lesley’s lamb steamed dumplings and my husband ordered the potato perogies with bacon. The soft drinks are from Tractor Beverage company so no Pepsi or Coke produces served here. They served the meal under ten minutes. 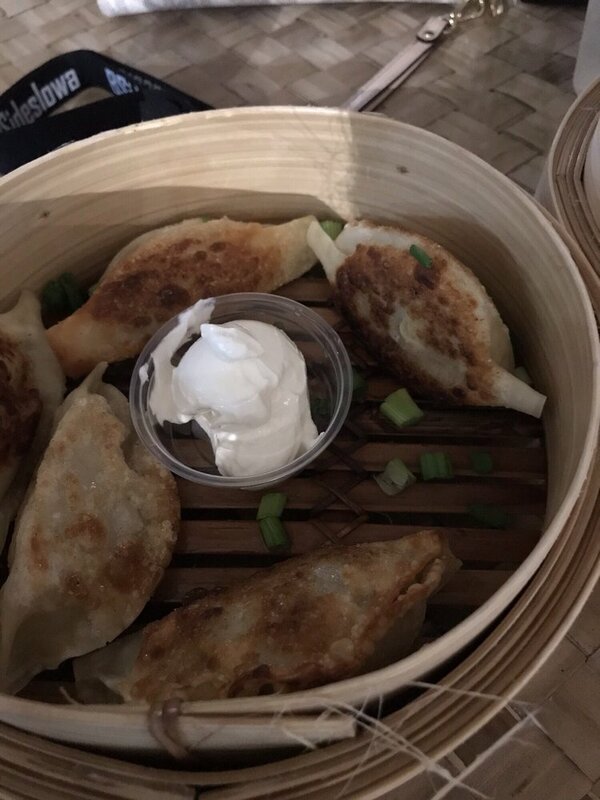 The food was delicious and I wished that we had more people in our group so we could have ordered the Mega Flight which is four of each of the steamed and fried dumplings they serve, forty dumplings in all so I could try a variety of dumplings. So if you want to try Dumpling Darling I would suggest going in the off hours like we did so you don’t have the crowd to deal with. I give it four out of five stars. 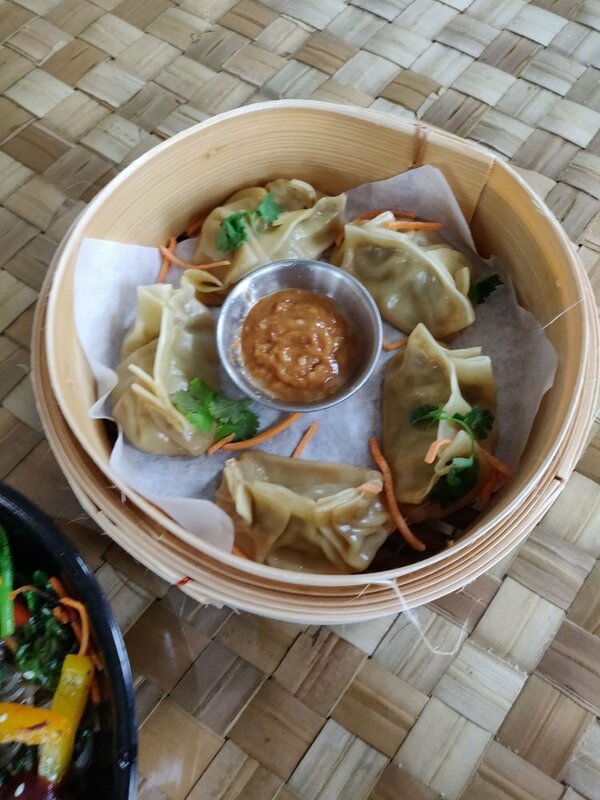 This entry was posted in Reviews and tagged Asian Cuisine, bao/buns, Des Moines Iowa, Dumpling Darling, fried dumplings, new dining experience, potato pierogies, restaurant, steamed dumplings, Tractor Beverage Co.. I liked this series. It is base on the 6000 year old apocalyptic story of good vs evil. It starts out with a run on sentence lasting a full paragraph describing the Second Death. The Second Death is a dimension made by the Creator for the Fallen, those who rebelled against the order of the Cosmos. 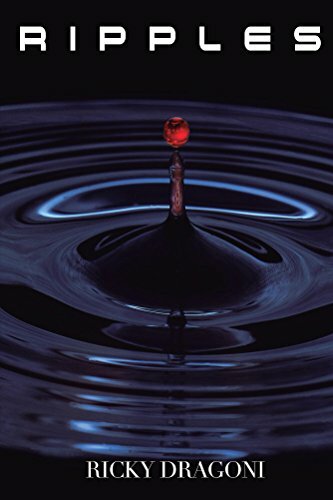 Jessie Hailey, a sixteen old with an alcoholic mother, hears a voice offering her a way out of her abusive live and power so she would be no one victim any longer. She starts out on a journey to release three Fallen or as the world calls them demons to help her release Nalsuu, Father of Darkness and Chaos. He has chosen her to be his queen. Those who would stop her are the Watchers, half-breeds, descendants of the joining between the Fallen and humans. They will be lead by the Chosen One to stop this apocalyptic from happening. It is a story that moves back and forth in time telling the intertwining of the lives of the characters. You can follow the story line easily. It keeps you involved throughout the story coming to a drastic climax with an opening to continue the story. The Second Death Supernatural Thriller Series: Books 1-3 and Prequel Novella (The Second Death Supernatural Thriller Series Box Sets) Kindle Edition. 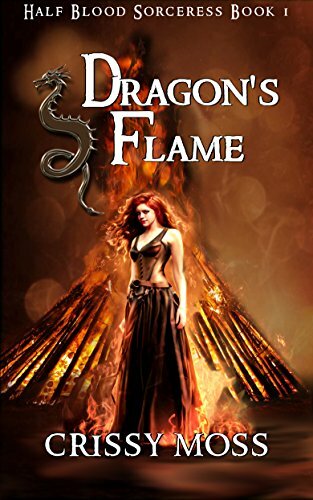 This entry was posted in Reviews and tagged fantasy, metaphysical, mystery, paranormal, science fiction, supence, supernatural, thriller, visionary. My stars on the review of Lucifer’s Star is a mixed one. The story is the after mass of Commonwealth vs Archduchy of Crius. We find the main protagonist Cassius Mass Plantagenet living under the assumed name of Marcus Grav, navigator on the spaceship, Melampus. Marcus is hiding from his past. The Commonwealth branded him a war criminal with a price on his head while to the Archduchy of Crius, he is a war hero, the recipient of the Lucifer Star. Cassius is not the normal hero. His father had Cassius cloned from his DNA then enhanced Cassius with military grade cybernetics along with a cybernetic brain to go with it. Because of these enhancements he is considered a low second class human by the Commonwealth, the Butcher of Kolthas, the Fire Count, and not considered much better by the Royalty of Crius. How can Cassius survive his past? Who can he trust, his shipmates, Captain Ida Claire who is a Watcher, The Commonwealth, or Crius Reborn Movement? Each has their own agenda of getting their hands on Cassius. On the story line, I give a resounding five stars. The authors did a great job weaving several different Sci-Fi concepts together drawing the reader into the story. On certain content of the story line because of my own preference, I give a solid three. If the reader does not like the “F” bomb and certain life styles Lucifer Star is not for them. SO when you combine the stars and average it out the overall rating is a four star novel. This entry was posted in Reviews and tagged action adventure, Archduchy of Crius, Cloning, Commonwealth, Cyborg, sci-fi, star fighter pilot. I just received a five star review from a fan. I want to thank all my fans and really appreciate the time they take to give me reviews on my novels. A great collection of mysteries built around solid characters. Sue Raymond weaves a nice set of adventures around Su Michael Anderson and Jean DeBois. They have a delightful antagonist relationship where Su doesn’t have room for romance in her life with business and her adopted children– let alone becoming a witness. Watching him try to deal with her is always entertaining and the attitude she gives him is quite fun. This is a good bargain and enjoyable book trilogy throughout. One of these days I’m going to be able to feature the exact page without trouble. LOL! 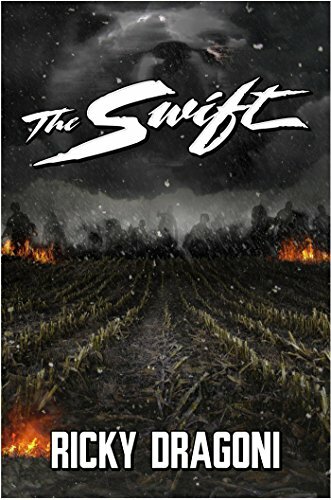 This entry was posted in Reviews and tagged adoption, assassin, CEO, coast guard, crime murder mystery, drug cartel, drug smuggling, faith, Grand Gypsy Vanner, Harley Davison motorcycle, Iowa, New York City, novel, trilogy, Witness Protection Program.